A letter from A. W. Macfarlane to Henry Shelton Sanford dated December 23, 1884. Macfarlane was the secretary for the Florida Land and Colonization Company (FLCC) from 1884 until its dissolution in 1892. Presumably, he worked in the company's main office, located at 13 Austin Friars in the business district of London, United Kingdom. In this letter, Macfarlane described in detail the minutes of the board of directors meeting held the day prior. In discussing the various topics of importance, Macfarlane conveyed the strained relationship between the board of directors and Henry Sanford. In particular, the letter illustrated the mutual misunderstandings and differences of opinion held by Sanford and the London-based investors. 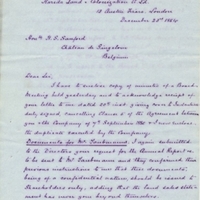 On page two, when discussing the financial state of the company, Macfarlane noted that "the Directors desire me to express their regret that you have not indicated to them some practical means of raising money to meet the above requirements [and] the Debentures shortly falling due." The letter reflected the board's lack of trust in the financial strategies advocated by Sanford. Original letter from A. W. Macfarlane to Henry Shelton Sanford, December 23, 1884: box 54, folder 1, subfolder 1.4, Henry Shelton Sanford Papers, General Henry S. Sanford Memorial Library, Sanford Museum, Sanford, Florida. Digital reproduction of original letter from A. W. Macfarlane to Henry Shelton Sanford, December 23, 1884. Box 54, folder 1, subfolder 1.4, Henry Shelton Sanford Papers, Henry Shelton Sanford Papers, General Henry S. Sanford Memorial Library, Sanford Museum, Sanford, Florida. Macfarlane, A. W. . “Letter from A. W. Macfarlane to Henry Shelton Sanford (December 23, 1884).” RICHES of Central Florida accessed April 20, 2019, https://richesmi.cah.ucf.edu/omeka/items/show/3396.